Our shootout winner, the Milwaukee framing nailer ties together excellent performance, light weight, perfect balance, and a full feature set. We can't make any major criticisms of this tool. It works, and it does it really well. Roofing and framing out houses is hard work, and we appreciate when a tool doesn’t go out of its way to make that job any harder. 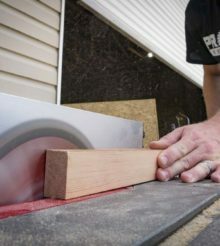 We recently took a look at 14 different framing nailers, both pneumatic and cordless models, to see which manufacturers actually improve the framing experience by making quality tools. Running each nailer through our battery of tests, we were able to determine a winner for the Best Framing Nailers on the market right now. Today, we’re taking a closer look at our shootout winner, the 3-1/2″ Milwaukee framing nailer (model number 7200-20). Usually, in our shootouts, we have high expectations for Milwaukee products, but they’re not exactly known for their pneumatic nailers the way other brands in the space are. So how did Milwaukee manage to surpass names like Bostitch, Hitachi, and Ridgid to claim the number one spot? To come up with an ergonomics rating, we look at everything that from weight to grip that will affect how the nailer feels as you use it. Weight is an important factor considering how often you use a framing nailer at or above should height. As far as weight goes, the Milwaukee framing nailer manages a relatively light 7.66 lbs. Ultimately, it was the third-lightest nailer we picked up, and because of its near-perfect balance (the highest balance score of the lot), you’ll have to look long and hard for a more comfortable nailer to use over a long day. If you can’t fit the nailer between studs or into a corner for toenailing, it doesn’t do you a whole lot of good. The 7200-20 has a tip-to-back cap height of 14″, and a head width of 4.75″. There are nailers with a smaller footprint, but Milwaukee’s shouldn’t get in your way. Milwaukee’s has a fairly standard handle design. The rubber overmold keeps the grip comfortable and secure with a diameter that’s not too wide. Overall, the Milwaukee framing nailer walks away with the second highest ergonomics score behind Hitachi’s NR90AE(S1). Feature sets can go a long way to making a tool more convenient and enjoyable to use, and we always appreciate Milwaukee’s commitment to user convenience. In this case, the 7200-20 framing nailer ties in just about every feature that you should realistically expect from a pneumatic framer. The Milwaukee framing nailer features an adjustable, removable rafter hook. Milwaukee might opt for a metal rafter hook instead of plastic next time around, but it’s certainly not an unusual move. Milwaukee includes an adjustable exhaust, which we didn’t see on very many models. This helpful feature allows the user to reposition the exhaust so that they don’t have to catch a face full of air everytime the nailer gets fired. The Milwaukee 7200-20 also features an all-metal magazine. This feature came standard on all of the pneumatic nailers we tested, which we prefer over the standard plastic magazines that come on cordless models. The action feels smooth and crisp, and the build seems durable. Additionally, you can fit seventy-two 2″ – 3-1/2″ nails into the magazine. We did notice that larger diameter nails can occasionally snag in the magazine. Overall, it was a really minor issue that was easily resolved. Dry fire lockout isn’t a given in the framing nailer world, but it is a welcome addition that extends the life of the driver blade. For Milwaukee, lockout kicks in at 5 remaining nails. Most every framing nailer will allow to switch between single fire and bump fire modes and some are easier than others. Milwaukee keeps in simple – just push the switch and twist. Milwaukee sticks with tradition with an easy-to-use depth adjustment wheel. I don’t have any major complaints with the placement or action, though this is another piece that can stand to make the switch to metal in a future upgrade. We use our framing nailers on a variety of materials, and we need the power to be able to get through all of them. That’s why we chose a challenging medium to test out all our nailers: 5 layers of plywood, all held together with wood glue. The Milwaukee framing nailer can fully drive all the nails we sent into our test material, and it still had 3/8″ worth of depth adjustment to spare. It’s in a tie for 1st place for driving power with 3 other models. We also ran our nailers through some toenailing tests. Here, we set untreated pine boards at 90° to one another, firing our nails into the corners of the boards at an angle. Most of our nailers handle this task well, though some nose designs are better than others. The nose on the Milwaukee 7200-20 has a solid design, with 6 barbs that circle the muzzle. This ensures that the nailer can bite into the wood, even when approaching from an unorthodox angle. Milwaukee ends up in a 7-way tie for 3rd place here. Accuracy might not be the biggest priority with a framing nailer, but it doesn’t hurt to be able to see on the occasion that you really need to be accurate. The Milwaukee 7200-20 has enough visibility around the nose that we could score near-perfect accuracy on all of our shots. None of the models we looked at are particularly bad in this department, but Milwaukee’s design is among the best in a 4-way tie at the top. While Paslode owns the recoil control category, the Milwaukee framing nailer provides excellent recoil control. Again, Milwaukee is in a 7-way tie for 3rd place in this category. We like to look at what you get for your money when determining a value rating. In this case, the Milwaukee framing nailer retails for $229. Relative to most of the other pneumatic nailers, this is just a little bit pricier, but not by a whole lot. Given what the nailer offers in both features and performance, it’s a solid value. It also comes with a 5-year warranty, which provides a bit more value and a lot more peace of mind. Milwaukee is in the middle of the value pack with a solid 4.6 out of 5 stars. Overall, the Milwaukee framing nailer finishes in 1st place with 96.4 points out of a possible 100. That might be a surprise to some users looking at a star-studded start list in our shootout, but that’s exactly why we spend so much time on these head-to-head tests. At the end of the day, you won’t find a better balance of performance, features, ergonomics, and value than you get with the Milwaukee 7200-20. Now for a m18 framing nailer! Now please make an M18 framing nailer Milwaukee, I know you hear me! Get ‘er done!